In our search for more precise steering for Project Sucker Punch, our 1954 Chevrolet Bel Air sedan, we linked up with Ididit to help find a viable solution. Without a doubt, Ididit made a solid recommendation, which we rolled with. Follow along as we show how it all turned out for the fat-fendered Bel Air project, and its overall functionality. A look at the steering column Ididit built specifically for Project Sucker Punch. Installation was extremely simple with the adapter and everything lined up great. “Since we upgraded to power steering with the TCI suspension, a smaller wheel was needed so I logged onto Jegs and found a wheel, adapter, and horn button that matched the Ididit column perfectly and looks great in the car,” Hahn said. Once we were lined up with a custom-made steering column, it was time to put the unit into Sucker Punch – which had become less of a hidden punch and more like a left hook to the liver. “The installation was fairly basic. Borgeson provided us with a vibration damper universal joint that Todd Walton of Walton Fabrication recommended for a power rack,” Hahn said. Walton also helped immensely with the build by relaying their advice to help make everything fit without hassle. 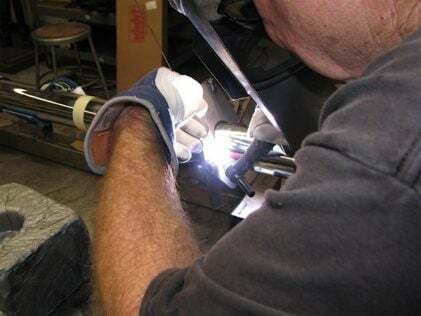 TIG welding the firewall plate to the steering column. Walton Fabrication was quick to solve the problem for car owner Aron Hahn, welding his plate from their steering column kit in unison with the custom Ididit column. Ididit provided the column and shifter cable as Jegs and Borgeson helped out with the missing pieces to complete the installation. Performing the installation himself, Hahn said it was fairly straightforward. Making the proper measurements, Walton modified Hahn's steering plate to complement the build. From precise welds to relocating install points, everything turned out perfect in the end for Sucker Punch. Tight fit with the limited room in the engine bay, but the column provides the perfect angle for the double-D shaft to connect with the steering box. Notice the Walton fresh air duct covers (above and to the right of the steering column) that we used to delete the fresh air ducting without leaving a massive hole in the firewall. Providing better overall steering, Hahn was pleased with how the steering fabrication turned out. With the help from Ididit, Borgeson, Jegs, and Walton Fabrication, he is now able to command the road with more precision and confidence than ever before. A fairly simple set-up, it took the powers of four separate companies to make it all work in the end. 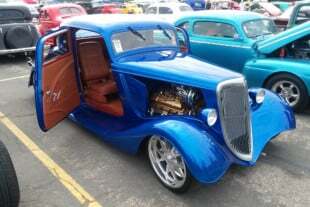 Sucker Punch is the epitome of custom, and this column fabrication upgrade serves as one of the reasons the car is so unique. Stay tuned as we still have much to accomplish on Sucker Punch. Be sure to visit the Sucker Punch build thread to stay up to date with what’s going on. This completes our custom look interior and provides exceptional steering control that was beyond anything existing in 1954.